By Rich Garcia, award-winning chef and industry leader for his sustainable business practices. Crossposted from his blog. Follow him on Twitter @ChefRichGarcia. Trash Fish Dinner is sold out next week (while you can add yourself to the waitlist HERE), and I have decided to use a clam…..not just any clam, a clam that’s almost hard to talk about. Every time I say its name I watch the faces of horror I get. The rare but delicious Blood Clam. Ask any well seasoned fishermen if they have ever tasted them….most will say, nope. But trust me, absolutely nothing wrong with eating them! Tonight at the hotel, raw on the half shell with lime and cilantro (South Americans use them for making a-la minute ceviche on the beaches with lime and cilantro). Question I’ve been getting all day……Chef, do they really bleed? Well……Yes they do and so do traditional local clams. 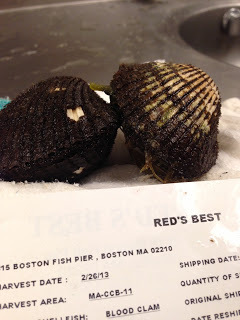 But don’t worry, our blood clams are safe! The clams here, which are found in the muddiest part of our local bays, are disease free and mostly sold to Asia as it is a delicacy but more importantly, much safer to eat from our waters, and also sold to South Americans, mostly Ecuadorians, who make ceviche out of them. We will be using them to make our interpretation of a traditional street food in Indonesia, Blood Cockle Satay. We are also using local Maine shrimp to make our version of a Sambal. So looking forward to this dish development process! And I hope for those of you that were lucky to get a seat at the table next week….you enjoy them! 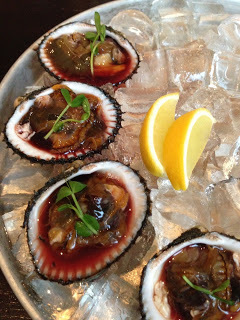 Where can I catch blood cockles in East Coast? I live in New York City…I’d go to Cape Cod if I know where exactly it can be caught…please tell me! Thanks!!!! This clam looks like Anadara ovalis, which is sometimes called the Blood Ark. It is not really a cockle at all.